There was a photography contest in the newspaper encouraging us to shoot a picture reflecting our life in the UAE to win daily and bumper prizes. They specifically mentioned that it didn’t matter what camera we used as they were more interested in the subject than the quality of the pictures. I carefully selected a picture from my album and sent it to them. And visited the site every day hoping my picture would be in the daily winners list. But no such luck for me. When I went through the pictures of other participants I noticed there were many who posted multiple entries when the site specifically mentioned only one picture per person. I shot off a mail to the concerned to ask if it was allowed. I got a nice reply back saying that it was ok in the preliminaries but if one’s picture got selected for the main prize then all these details mattered. When the daily winners were announced at the site this picture too did not get selected. Very dejected I scrolled through the earlier daily winners to check out all their pictures. And then I see a very familiar picture, the first click I sent, nominated as a daily winner almost 3 days earlier. I don’t know how I missed seeing it earlier…..all that disappointment for nothing;-P.
My prize was a 5 hour photography workshop at the International Institute of Art and Photography in Knowledge Village. I registered for the workshop and chose to attend their ‘Basics of Photography’ session. The workshop was very helpful because until that day not much thought had gone into the pictures I took. I used to just ‘focus and click’ anything what caught my fancy. With the knowledge I gained from the workshop I now ‘compose’ the pictures in my mind before pressing the button. Now all this happened in December but for some reason I was reluctant to post the picture here even though I made a lot of noise about it in every post;-P. Honestly, everytime I decided to write about it I ended up writing something else and convinced myself that, that was more relevant and needed to be posted immediately. And everytime you asked about the prize-winning picture I was feeling sillier than ever because heart of hearts I felt it’s just a normal picture which was lucky to get selected. And then somebody I know very cunningly insinuated that if I don’t post it, all of you will surely be thinking that I was talking in the air and there was no such prize-winning photograph after all. What nonsense*N shaking her fist at the suspicious*. Please go here to check it out and while you are there, do check out the other winners too, some pictures are so beautiful. Then click on link 14[sorry there is no direct link to get there] to get to my picture. But if you don’t want to go there, then here’s the picture…. 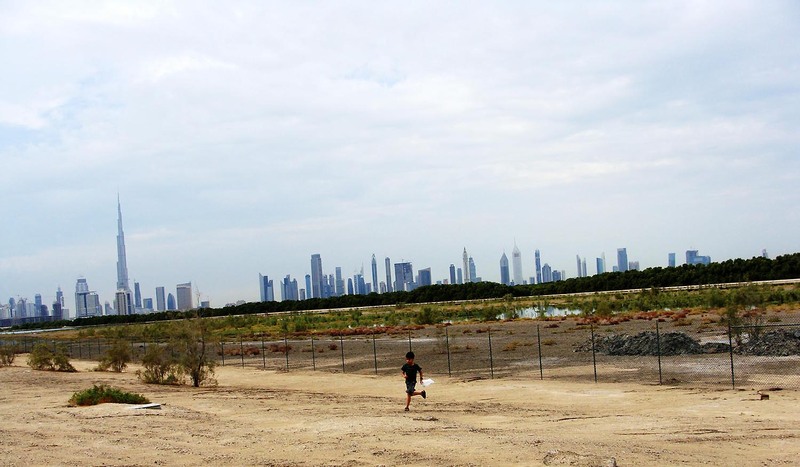 A few of us had taken our kids to the Ras Al Khor Bird Sanctuary last November to see the flamingos’ which the reserve was famous for but found it closed to the public because it was a Friday. Since the weather was pleasant we stayed there for sometime. The adults[especially me] spent time craning our heads over the wired mesh to look at the flamingos’ while the kids collected shells [I think the authorities must have brought sand from the sea-side and laid it there…how else could seashells be found right in the heart of the city]. The little boy in the picture is Neil who was running about here and there hoping to get better shells than his cousins who were at that time hunting for them on the other side. My new DSLR has instilled in me new enthusiasm & I’m raring to go. Hopefully in a decade or two I’ll master the complex buttons on the gadget and post some nice pictures like Sakshi and Hitchwriter do. p.s: If you are wondering about the flamingos’ I mentioned earlier, I've put up some pictures here. And, it is a very nice click!!!! So sorry to have kept you hanging Laila;-P.
WOW! congrats Nancy..that's a beautiful click! If the interest is there then it doesn't take much time for novice to become expert...here's hoping ur wish comes true very soon:-)). The flamingo photo should have won. Sometimes I feel that the scene is as important as the photographer. If the scene is great, a great photo automatically comes! I used to think like that but now I realize that in the hands of a good photographer any scene can be elevated to a 'wow' photograph:-). 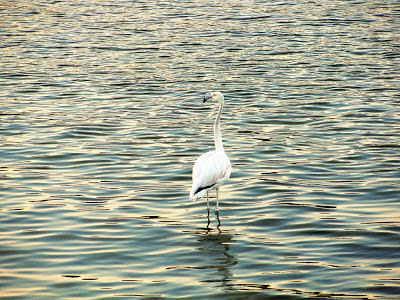 Just realised...u r talking abt the first picture[I thought u were referring to the flamingos' post on the photoblog]..
Way to go, my friend, may more awards come your way! Abhi atleast dus saal lagega half-way learned banne ke liye;-P.
Wow! the picture is really good, and I can see why it won the daily prize. 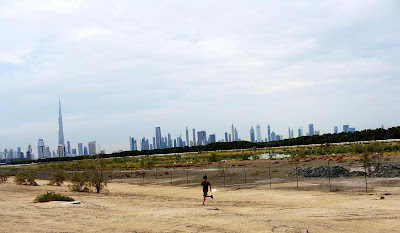 You get the blue sky, sky scrappers, green bushes, lake, sand and boy running in one frame. Colourful and cheerful :) I also loved the flamingo pictures. Oooooooh Seena you noticed all the details I'm sooo happy now. Seriously, I am...and you have a good eye I must tell you. Which means u take really good pictures tooo eh;-D.
Make sure you are part of http://www.facebook.com/#!/groups/photowalkdubai/events/ in the future. Okay if u say so Maddy...lemme check it out first;-D. And thanks Maddy:-)). Hello Star Photographer. Very nice indeed. Now the blog will be even more picturesque, we hope. waise if u dont mind, may i ask you, do you engage in any post photo editing? gen asking :) I have a lottttttttt of frns and cousins into photography who spent HOURS! on picassa or other editors and i am like whats the point.. Thanks Amrita, the software which comes with the camera has an option 'Autocorrect' which sort of brightens a picture if it's dark or darkens the pic if its too light. I use that option quite often. Then I also use crop & the resize option. I spend maybe 3-4 minutes doing tht. But yeah I've heard that even seasoned photographers nowadays use photo editing softwares to make their pictures attractive. What's the point....I guess competition is fierce and even while editing their picture they are being creative:-). Wow..thats brilliant ! I have a photography enthusiast at home too..! Yaayy and congrats ! These little prizes are a huge motivation ! But please dont leave us readers and keep blogging too..! We are ready to listen to the noise u make ! Oh yes I remember ur post on that & remember the picture u posted too. And u are right, these prizes are huge motivation...esp in my case it motivated my H to get me a DSLR;-D.
Hoping for many more to come. Me likes :) Congrats Nance! Glad to find your blog. Congratulations, Thats a beautiful click indeed. Thanks and welcome to my space Preeti:-)). p/s: I was in the UAE last month... and to my surprise, the weather was PERFECT!